Home should be a place of comfort and safety where you can relax and get away from the rest of the world. 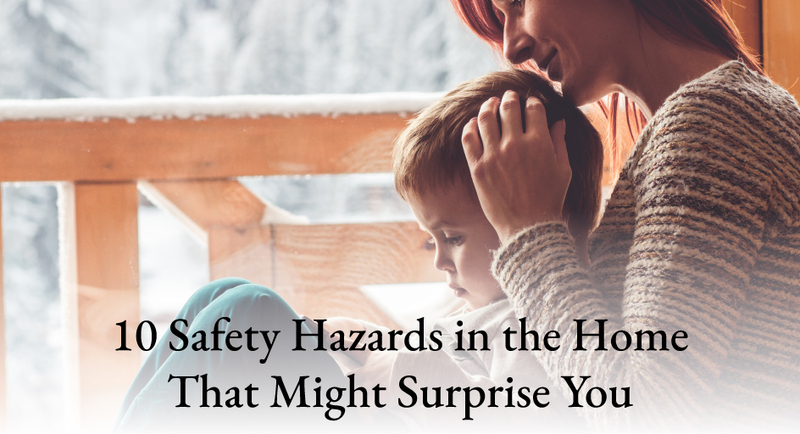 However, an unfortunate truth is that your home can be full of potential health and safety hazards – especially to children and pets. Read on to learn some of the most unexpected hazards, and make sure you take the steps to eliminate them in your own home. Whether it’s Mom’s purse, older brother’s backpack, or Grandma’s suitcase, bags can contain a wide range of items that would be dangerous if they fell into a child’s hands. Most common hazards include medications, tweezers, nail clippers, safety pins, hard candy, pen caps, and loose change. Many of these items are serious choking hazards, and it only takes a few seconds of leaving a child unattended for them to get into someone’s bag and find one of these items. Prevent curious kids from getting into bags by always storing them in a high place such as a shelf or rack where children cannot reach. Make sure the adults in the family make a habit of keeping bags off of the floor or other low places, and ensure guests in your home do the same. It’s probably unthinkable that your beloved pup could harm a child, but animals can react in unpredictable ways if provoked. Be sure not to leave small children alone with the dog, and teach your children to be gentle with animals so as to not provoke them. Pet toys and food can also present dangers to children, so be sure that the toys have no small parts and keep food out of reach when it’s not being used. Hand-me-down child equipment and toys should be carefully inspected before use. The older the items are, the more likely it is that they could have cracks or faults – even if none are visible from the outside. Secondhand items may not comply with up-to-date health and safety standards, so be sure to check everything against CPSC guidelines. Saving money is great, but safety should always come first. The long strings on some models of blinds pose a serious strangulation hazard to children. Tie up cords and keep them high, or opt for cordless blinds to eliminate the threat altogether. The most dangerous type of batteries are button cells, which are found in watches, hearing aids, calculators, and even some toys. These small, round disks resembling buttons are easily ingestible and contain fluids that could be fatal if leaked into a child’s stomach. Televisions keep getting more and more lightweight as technology progresses. If placed on a surface or console that is lower to the ground, the TV can easily become a hazard. A child could pull the TV down on top of them, and even bumping into a lightweight TV could cause it to topple over onto a child or pet. Securely mount TVs on the wall to avoid harm to little ones. Most of us know that detergent, especially in the form of pods, presents a tempting risk to small children. But did you know that the dishwasher itself can be a danger, too? If left unlocked or unlatched, dishwashers give children access to sharp knives and breakable items such as plates and glasses. Double check that your dishwasher is locked at all times, and hold off on inserting detergent until you are about to run a cycle. They enhance decor and purify the air, but some houseplants are incredibly dangerous if ingested. Both children and animals can come to harm by eating poisonous leaves or flowers. Make sure to research plants before putting them in your home, and if you must decorate with dangerous plants, place them out of reach from little ones and furry friends. The popular party decoration can be shockingly dangerous. If swallowed, the latex material can adhere to a child’s throat and constrict breathing. Keep an eye on children when balloons are present, make sure to quickly clean up any that pop, and consider purchasing foil balloons instead. This one seems obvious, but some may not realize that hand sanitizer contains high amounts of ethyl alcohol that can cause intoxication or alcohol poisoning if ingested by a child. Don’t forget to keep watch over smaller bottles of hand sanitizer that may be in a purse or pocket, since these are more easily accessed than larger pump bottles sitting on a counter. Take a look around your home and assess how many of these health hazards are present. You might very well be surprised at what you find, and you’ll definitely be keeping your family safer by performing regular checks.